I'm kind of on a Malbec runner here lately. I think this is the fifth Malbec I've reviewed in a little over a week. And there's nothing wrong with that. Nothing wrong at all! 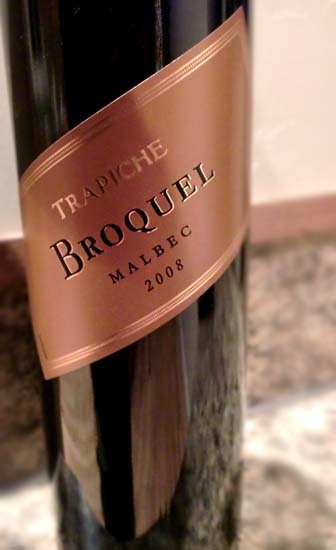 This is the 2008 Trapiche Broquel Malbec and, once again, it's another Malbec from the Mendoza Region of Argentina. I'm hoping that some day I can travel to Argentina and visit some of these Mendoza vineyards because there seems to be a TON of Malbec wines produced there. Sounds like an awesome vacation to me! 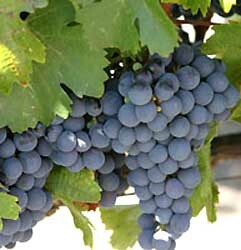 The 2008 Vintage Trapiche Broquel Malbec pours a deep, dark brick red color that verges on being purple. Aromas are of oak, cocoa, and a bit of dark berries. Tasting brings a dry mouthful of toasted oak, cacao nibs, espresso, cloves, vanilla, hints of earthy mushrooms, and a subtle background of plums and prunes. Without a doubt this is one of the drier and oakier Malbecs I've had in quite some time. If I had tasted this blind, I may have thought it was an over-oaked California Zinfandel. It doesn't seem to fit the typical Malbec profile in that it's lacking the big, bold black fruit notes, instead having a rather subdued fruit profile with charred oak being the predominant flavor. I could see the oak in this easily overpowering a lot of food pairings. It may match well with a black peppercorn steak or grilled venison, but even then it may be just a touch too oaky for some. Maybe drink it alongside a dark Maduro cigar. Like many Malbecs, this is a wine that most people will find polarizing. Personally I'm kind of torn as to whether or not I really like it. This may be one of those wines that you really have to be in the right mood to drink. Drink This: if you want to try a dry, oaky Malbec. Don't Drink This: if you're looking for a sweet red wine. This isn't even close to that... at all.